NoLandGrab: To be fair, it is NLG's recollection that Gehry stated that the presentation of the design "sketches" in The NY Times was "horrible." The starchitect cautioned several times during the presentation that the renderings and photos of models were still a work in progress. Toward the end of the article, the reporter, Ariella Cohen, appears to have misinterpreted the point made by Prospect Heights resident Peter Krashes. During his presentation, Gehry pointed to the general location of Krashes's house, the Dean St. block facing the eastern portion of the project, and said, "I don't know what's there." Krashes lives ACROSS the street from the project, not IN the footprint as Cohen suggests, and Gehry seemed to have a good idea as to what is facing Krashes's home in the current design. 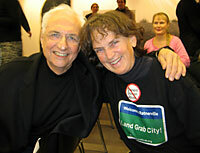 During the Q&A, Krashes told Gehry that his house was located in the area referenced earlier, illustrating the point that Gehry doesn't understand the project's context in relationship to Prospect Heights. Krashes also reiterated the criticism echoed by others, that "the project exists only in relation to itself." Cohen also got the "commercial and office space" figure wrong. The current estimate, if one includes the proposed hotel, stands at slightly less than a million square feet, not "nearly 2 million."